Bertrand Bonello, Nocturama, 2016, 35 mm, color, sound, 130 minutes. Yacine (Hamza Meziani). 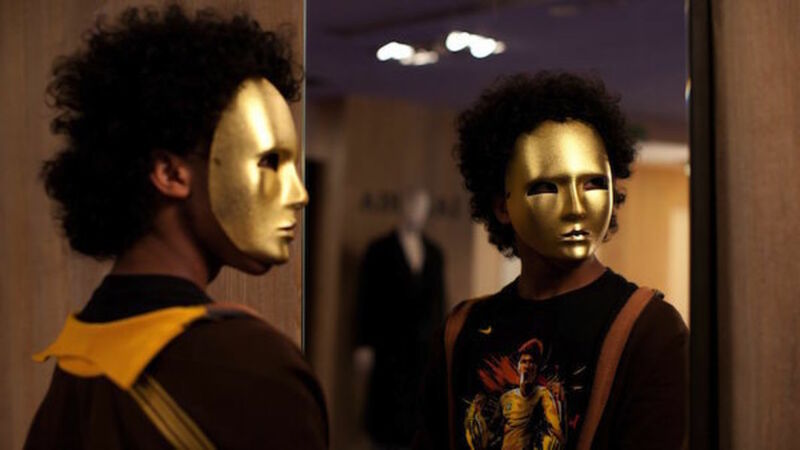 Released mere months after the series of terrorist attacks in Paris in November 2015, Bertrand Bonello’s provocative film Nocturama (2016) centers on a gang of French teenagers, played by actors and nonprofessionals, who conspire to blow up national and corporate landmarks throughout the city in a wave of coordinated bombings. It will be released from Grasshopper Film on August 11, 2017, and will play at theaters in New York before a larger US tour this September. The Film Society at Lincoln Center will also host “Deeper into Nocturama” from August 18 to August 24, 2017, a program featuring films selected by Bonello that have inspired his work. Additionally, his twenty-four-minute short film Sarah Winchester, Ghost Opera (2016), based on the biography of the eccentric nineteenth-century gun heiress, is now available on the Grasshopper Film website. NOCTURAMA WAS MADE BEFORE the Paris attacks, but it was released after. It was very difficult for people to see this kind of narrative. The film had some common points with the attacks, but at the same time it was very different. Islamist terrorism has nothing to do with insurrection—not in its classical sense. In the film, some young people are planting bombs to attack Paris in similar places and at simultaneous times. But it’s not reality; it’s not about ISIS, there is not a clear reason for their actions, and there’s no one explaining why these attacks are happening. Still, it was too tough for some audiences to watch. But when you mix reality and abstraction, it speaks to the success and the power of cinema. One of my favorite books—and one that helped me with the writing of Nocturama—is The Politics of Obedience: The Discourse on Voluntary Servitude by Étienne de La Boétie. It was written in the sixteenth century by a twenty-year-old, and it is still one of the strongest political books about insurrection. It presents ancient ideas: the notion of the people versus the state…and, well, actually, of freedom. We are very attached to freedom. It has always run through our history and culture. We live in a period that can create a person who is totally fascinated by terrorism and capitalism at the same time. If I had made Nocturama forty years ago I would have only made the first part of the film, because it was about the reality of the streets. The first part was shot during the day with a lot of movement in real places, including the Paris metro, almost like a documentary. It’s the second part of the film that makes it feel very contemporary, because it is in an artificial, commercial world that we constructed. We were very lucky to find an old department store in the center of Paris called La Samaritaine. It was totally empty, so we had to recreate everything inside. What was fascinating about it is that it doesn’t have any windows, so you are kept from the reality of the outside, as if you were in a box. The space was very expensive, so we didn’t rent it for that long. I think we had it for four weeks before the shoot, and then we shot inside of it for six weeks. Every Saturday and Sunday I would spend alone there—just walking around trying to find the next shot. These were weird moments. Some people talk about malls and department stores as dreamy places. In fact, they’re freaky; they’re a dream and hell at the same time. Trailer for Bertrand Bernello’s Nocturama, 2016. Cannes didn’t want the film, so we decided to go to the Toronto and San Sebastian festivals. The exclusion from Cannes probably didn’t help for sales and at the box office. There were so many articles and messages on online social networks that said the film was not selected at Cannes because of its subject. The controversy began from there, and it was difficult to stop it. Of course, I wonder how the film would have been received if it were released two years before. The French critics understood it. My problem was with the social networks, the blogs. There are a lot of haters on these platforms. In many of my films, like House of Tolerance, Nocturama, and Sarah Winchester, Ghost Opera, I’m attracted to places that become their own inside world. I heard of Sarah Winchester ten or twelve years ago, and when I read the story of her life I immediately wanted to make a film about it. I started to write a treatment, but it immediately became too expensive. And it had to be an American film, because it was a real American story. I didn’t feel like I could achieve it, so I left it on my desk and dropped it. When the Paris Opera gave me carte blanche for a project as part of its Third Scene initiative, I decided the form of the opera would be an amazing way to tell the Winchester story. I’m still surprised that there is not an American film about this story—someone like Michael Cimino could have made an amazing version of it, a true story about America based on one woman.